Testing for myotonic dystrophy has been out of the reach of many labs – until now. The launch of the new AmplideX PCR/CE DMPK Kit from Asuragen, available exclusively through VH Bio in the UK, delivers a groundbreaking alternative for the detection and sizing of CTG trinucleotide repeats within the DPMK gene. Myotonic Dystrophy is a genetic disease that affects around 9,500 adults in the UK, and is among a group of around 30 diseases collectively known as muscular dystrophy. Myotonic Dystrophy Type 1 (DM1) can occur as a result of triplet repeat CTG expansions in the DMPK gene. The size of the trinucleotide repeat expansion is associated with the severity of signs and symptoms. People with the classic features of type 1 myotonic dystrophy, including muscle weakness and wasting beginning in adulthood, usually have between 100 and 1,000 CTG repeats. People born with the more severe congenital form of type 1 myotonic dystrophy tend to have a larger number of CTG repeats, often more than 2,000. This form of the condition is apparent in infancy and may involve life-threatening health problems. In addition, the genetic mutation is passed down, with the size of the CTG repeat expansion often increasing in size. While there is no cure, it is possible to offer some level of management of the symptoms, which can range from cataracts, mild myotonia and diabetes in mild forms of the disease, through to cardiac arrythmia, balding, intellectual disability and respiratory deficits in congenital cases. What are the challenges involved with testing for DM1? Myotonic dystrophy testing remains out the reach of many laboratories – either unattainable, or, at best, very difficult and impractical. Expansions can extend beyond 1,000 CTG repeats, demonstrate a high degree of mosaicism, and current laboratory workflows require both PCR and cumbersome Southern Blot (SB) analysis to adjudicate DM1 repeat status. In addition, expansion is may not be present in all cells, and allele drop-outs are indistinguishable from homozygous samples. The newly-launched AmplideX PCR/CE DMPK Kit aims to revolutionise how repeat expansions within the DMPK gene can be analysed, with the aim of bringing this analysis within the reach of more laboratories. The DMPK kit overcomes these challenges and enables the sensitive detection and sizing of these DMPK repeats by employing a method to PCR-amplify the DMPK trinucleotide CTG fragment followed by accurate sizing by capillary electrophoresis (CE) – all within a single laboratory shift and without the need for southern blot confirmation. In addition, it delivers a simplified workflow thanks to its proprietary PCR solutions for GC-rich amplification and detection, along with the eliminated need for Southern blot. The kit is an end-to-end solution that reduces hands on time, optimising workflow by allowing direct injection of PCR products into CE instruments. It is possible, for example, to go from sample to result within a single working shift, which represents a significant improvement for operators. There is no trade-off for the improved workflow and simplicity, either: DMPK analysis is performed with greater sensitivity and accuracy, with accurate sizing of all alleles ≤200 CTG repeats and detection of all alleles >200 repeats using CE. The optional AGE protocol allows sizing of alleles between 200-2000 repeats. This simple, accessible kit brings DMPK testing within the reach of laboratories everywhere. 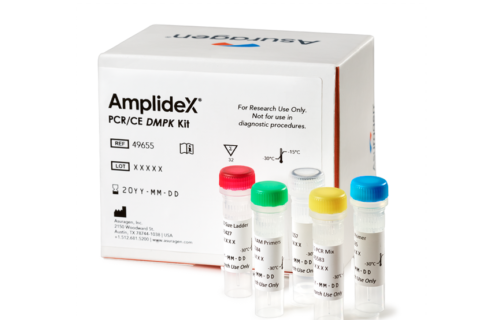 For more information about the AmplideX PCR/CE DMPK Kit, available exclusively in the UK from VH Bio, you can visit the product page here, or contact us via the details on this page. To shop by our suppliers, please click their logos.